Long and flowing skirts used to be the unofficial uniform for hippie chicks and traveling bohemians back in the ’60s and ’70s. And while these pieces may have been on-trend back in the day, a retro peasant skirt is tough to pull off — especially because it limits you to daytime looks (and, well, meadows). Eventually this long skirt style evolved from counterculture costume to the mainstream maxi — which happens to be one of the biggest summer 2013 fashion trends. This season’s maxi skirts have the same carefree feeling as their peasant skirt predecessors — after all, you can still wear them at music festivals. But they also work for elegant nighttime looks, edgy downtown styles, and even casual Fridays in the office. So, we rounded up our favorite maxi skirts for the summertime to help you stay breezy and (slightly) boho chic. We’ve got sleek silhouettes, sheer chiffon fabrics, and modern prints. We’ve even thrown in some sequined maxi skirts. To keep your maxi skirt less “free love” and a little more chic, try these styling tips: If it’s a high-waisted maxi, pair it with a fitted crop top to show a bit of skin at the slimmest part of your body. 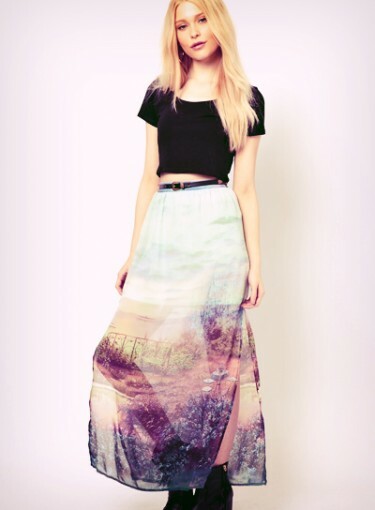 If the maxi skirt skims below your ankle, wear heels or wedges to avoid an embarrassing trip. Keep clicking to see the summertime maxi skirts you’re going to want to own this season.